KV School Admission for Class-1 – How to register for Online Admission of Class-1? These instructions pertain to online application for admission (during Feb-Mar 2019) to Std 1 in Kendriya Vidyalayas for the academic year 2019-2020. In the remainder of these instructions, a “Vidyalaya” means a Kendriya Vidyalaya. Please familiarize yourself with Kendriya Vidyalaya Sangathan (KVS) admission rules, regulations and guidelines available at http://www.kvsangathan.nic.in/AdmissionGuideLine.aspx. You are strongly advised NOT to submit multiple applications to the same Vidyalaya for the same child. If any Vidyalaya detects multiple applications for the same child, all applications of the child to that Vidyalaya will be considered null and void. details of government certificate in case you are applying under economically weak section, transfer details of parent/grandparent whose service credentials will be used in the application. There are two necessary steps involved in successfully submitting an application form. The minimum age for admission to Std 1 is 5 years and the maximum admissible age is 7 years as on 01/04/2019, with a 2 year relaxation in upper age limit for “Differently-Abled” candidates. On successful registration, you will be assigned a unique Login Code. Please note down your unique Login Code carefully. Filling and submitting application: The Login Code obtained after registration must be used to login and fill the online application form. You can indicate choice of up to three (3) different Vidyalayas in India, without any preference between Vidyalayas, in a single form. After filling in the application form, it must be submitted by clicking on the Submit Application button. On successful submission, you will be assigned a unique Application Submission Code, that is different from the Login Code. You will also be shown a list of original documents to be submitted to a Vidyalaya at the time of admission in case provisional admission is offered by the Vidyalaya. Please note down your Application Submission Code and the list of documents to be submitted at the time of admission carefully. Only after both steps 5a and 5b above have been completed, is the application process completed. Completing only step 5a will NOT result in your application being submitted to KVS. Your application is NOT submitted and your application data will NOT be visible to KVS until you receive an Application Submission Code from the online admission portal. Completing the registration and submitting an application requires use of one-time password (OTP) that is sent by SMS to the mobile number provided during registration. You are strongly advised to register your own mobile number (with Indian SIM card) and not that of relatives, friends, agents, cyber-cafe operators or others. Details provided at the time of registration cannot be subsequently changed in the admission form. Please enter these details correctly and exactly as per documentary evidence (like birth certificate) available with them. In the application form, a Save Application button has been provided to help you save (possibly partially filled) data, and resume filling the form at a later time. By clicking the Save Application button, the form is only saved for you to continue filling it in a later session. The form is NOT submitted to KVS by clicking on the Save Application button. The only way to submit the form to KVS is by clicking on the Submit Application button after filling in the entire form, at the end of which an Application Submission Code is generated. Once an application form has been submitted and Application Submission Code generated, the submitted application form cannot be edited. If you realize that incorrect information has been submitted in your application, you have the option to cancel your submitted application. Canceling a submitted application requires use of an OTP that is sent to your registered mobile number. This is meant to prevent accidental cancelation of a submitted application. An application, once canceled, cannot be revived, and the Application Submission Code for the application becomes null and void. Data from a canceled application form will NOT be visible to KVS after cancelation of the form. After canceling a submitted application, you can re-apply using the same Login Code before the last date of submission of applications. However, this will be treated as a fresh application, and must be filled in and submitted all over again. A new Application Submission Code will be generated when the fresh application form is submitted. Only your Application Submission Code (and not your Login Code) must be used for all communication with KVS and with the Vidyalayas you have applied to. All fields in the online form marked with a red * are mandatory, and must be filled in. The portal will not allow you to proceed until all mandatory fields are filled in. For admission application under Special Provisions as detailed in KVS guidelines (http://www.kvsangathan.nic.in/AdmissionGuideLine.aspx), except in Single Girl Child category, please submit the online application form through the portal, and then contact the Principal of the concerned Vidyalaya directly (not through the admission portal), citing your Application Submission Code along with all documentary evidence required for applying under ‘Special Provisions’. For admission application in Single Girl Child category, please submit the online application form and upload required documents like any other admission application. There is no need to contact the Principal of the Vidyalaya (to which the child is seeking admission) directly in this case. 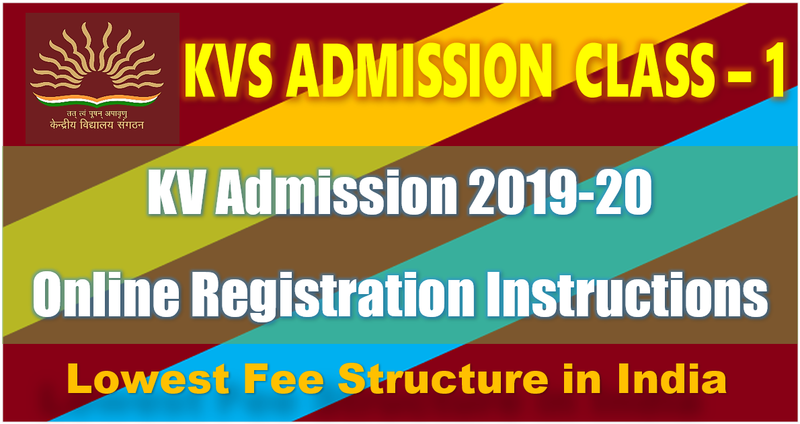 For twins/triplets/… who are eligible for admission in Single Girl Child category as per KVS guidelines (http://www.kvsangathan.nic.in/AdmissionGuideLine.aspx), you must register, fill in and submit the online application form separately for each sibling. To ensure that the applications are considered together for admission in Single Girl Child category, the individual applications must be linked using a Linking Code generated by the online admission portal. Please see detailed instructions for generating and using Linking Code in point (xi) of Section (2.4.1) of instructions (Instructions for filling in admission application form and uploading documents). Mere registration and submission of the application form DOES NOT confer a right to admission to any child. Admissions will be offered by individual Vidyalayas, depending on available seats and as per KVS guidelines (http://www.kvsangathan.nic.in/AdmissionGuideLine.aspx) after examining application details, and after originals of all required documents have been produced at the time of admission. Please check the results/shortlists of admissions with individual Vidyalayas on the dates announced by KVS/individual Vidyalayas for declaration of admission results. In case provisional admission is given by a Vidyalaya after the results are announced, originals of all supporting documents listed while submitting the form must be presented to the concerned Vidyalaya at the time of admission. Failure to provide these original documents may lead to the admission being canceled.